GARDENA, Calif., July 6, 2017 – The Carroll Shelby Foundation was a key sponsor of Children’s Hospital Los Angeles’ (CHLA) inaugural Walk L.A. event, which raised funds to improve healthcare for children. The fundraiser eclipsed its goal as over 1,200 people participated in the 4-kilometer walk on the morning of June 17, 2017, at Griffith Park in Los Angeles, California. The Foundation board is committed to following Mr. Shelby’s original vision. Recently, fate provided the non-profit with a new opportunity to fulfill their charge. When the opportunity to sponsor the inaugural Walk L.A. event arose, the Carroll Shelby Foundation immediately got on board.Along with showing their public support at the event, their sponsorship included a $5,000 donation that went directly to the Helping Hands Fund. This program ensures that all CHLA patients receive the critical, lifesaving care they need. The 4-kilometer walk began at 8:30 am at the Crystal Springs picnic area of Griffith Park and was followed by a Wellness Family Festival that included activities, giveaways, food trucks, Zumba class, drum circle, games and entertainment. 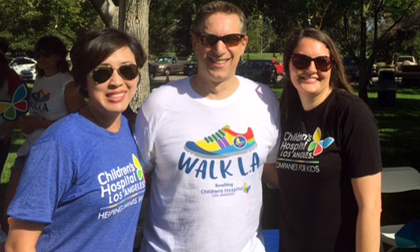 Members of the Shelby team were also at the event to help raise money and awareness for CHLA. The event’s initial goal of $250,000 was exceeded as more than $370,000 was raised. Individual donations reached an impressive $336,212, with nearly $40,000 more raised from corporate sponsors. Donations are still being accepted through the end of July at WalkLA.org. The funds raised from the event will go to CHLA, which provides more care for children than any other hospital in the region. CHLA relies on the generosity of its supporters to provide lifesaving care for children. The Carroll Shelby Foundation was created by legendary racer and automotive manufacturer Carroll Shelby. Headquartered in Gardena, Calif., the Foundation is dedicated to providing medical assistance for those in need, including children; educational opportunities for young people through automotive and other training programs; and also benefits the Shelby Automotive Museum. Visit www.shelby.com. Tags:Aaron ShelbyCarroll Shelby FoundationNeil CummingsWalk L.A.